On December 18th, nonprofit organization EnoB visited NY Milal missionary team to present a charity concert. 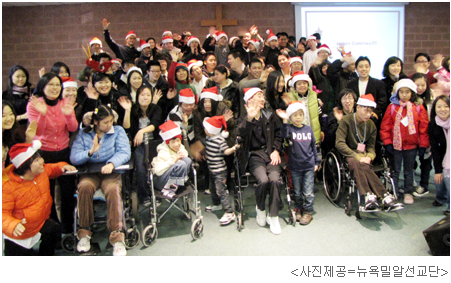 EnoB performed exciting Christmas carols for 50 or more people at Korean-American church in Queens. 비영리단체 이노비(EnoB)가 18일 장애인단체인 뉴욕뉴저지밀알선교단을 찾아 위문공연을 펼쳤다. 50여명이 모인 가운데 퀸즈 한인교회에서 열린 행사에서 이노비는 신나는 크리스마스 캐롤 메들리를 선사해 성탄절 분위기를 한껏 연출했다.